Saturday March 30, 2019 from 9:30 am to 2 pm. This single day retreat is open to all interested in deepening their spiritual life. As DOK we welcome you to join us for spiritual refreshment and growth at this Quiet Day. Preregister by contacting the Church office by March 18th. Cost: $10 to cover the lunch, please bring the funds the morning of the event. The Gift Shop has limited snacks and drink. Space is limited! Reservation Deadline is April 5. I hope you had the opportunity to read about this ministry in the recent edition of Jubilate Deo. I have attached the pertinent article to this email. You may not realize that the author of the article, The Reverend Joyce Harder, is a longtime Daughter of the King and serves as the Chaplain of the Christ Church Chapter. God called Joyce to ordination to serve Him in Kairos Outside and to establish the ministry in the Lowcountry. The Reverend Janet Echols, our Diocesan Chaplain, serves Kairos Outside Lowcountry as Spiritual Advisor on the Advisory Council. The upcoming Kairos Outside Lowcountry Weekend #1 offers an opportunity for Daughters of the King to fulfill our vows of Service and Evangelism while supporting DOK Sisters in Christ. The weekend is scheduled March 29-31. Deacon Joyce has outlined two ways we can actively support Janet, her, and the Ministry. 1. Pledge to pray specifically for the weekend. You can start now! Joyce asks that you email me with your commitment. mslott12@me.com Your name will be placed on a strip of construction paper to be fashioned into a very long chain that will create a visual of the prayers of the saints for the Guests. Other ways to support the ministry are outlined in the attached Jubilate Deo article. Please prayerfully consider blessing our DOK Clergy, Joyce and Janet, the Kairos Outside Lowcountry Weekend #1 Team, and the Guests with your support. Looking for a service project that provides fellowship for your Senior or Junior chapter and a yummy treat for someone or a group you want to thank and help them feel extra special? 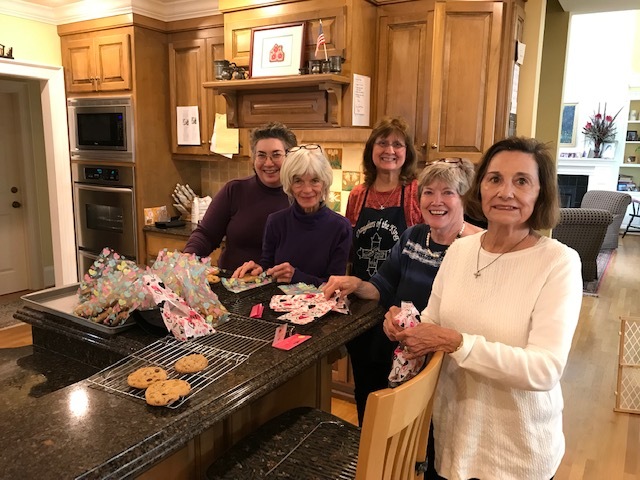 St. Agape Chapter at St. John's, Florence, recommends a cookie baking project that was fun, and our staff at St. John's, Florence, enjoyed being treated on Valentine's Day for their many contributions to our parish. We baked regular chocolate chip cookies and also some lower sugar chocolate chip cookies, using the same recipe, but a sugar substitute for the brown sugar and regular sugar. We added cards with the scripture "... God is love." 1 John 4:7-8. This project could be used when visiting retirement homes, healthcare facilities, new families, etc. Note: Check on any food or allergy restrictions. On behalf of Carol Hill, President of the DOK Joanna Chapter, we would like to thank everyone for attending the Feb. 9th regional meeting. Several people asked for recipes. Sauté sausage(brown), add onion, bell pepper, garlic and sauté until tender. Add other ingredients, simmer 30 minutes. Sauté the Onion, salt, celery, Red Bell Pepper, Sweet Potato, Garlic and chili powder. Add the rest of the ingredients and simmer until the sweet potato is tender (around 15 minutes). (see the note on the carrots) Also, may need more liquid such as tomato juice or water. Beat softened butter and sugar until blended. Mix in yolks, extracts, add flour and ground ginger. Add candied ginger, nuts or Rhine(zest) divide into 3 parts. Roll into logs. Refrigerate overnight. Slice logs into 1/3 inch thick. Place on parchment paper on cookie sheet. Bake at 350 for about 15 minutes until lightly browned. Cool on pan for about 10 minutes until removing to cooling rack. Variations: Ginger, almonds, lemon, lime or orange and cinnamon. The Rev. Joyce Harder, Deacon at Christ Church and Daughter of the King, was ordained as Deacon in 2016 with a focus on Kairos Outside, a program that ministers to women whose lives are impacted by the incarceration of loved ones. Spring Prayer Retreat "Be still and know that he is God"
"Be Still and Know that He is God"
This retreat is open to ALL WOMEN, so please invite your friends. Summer Gross is an Anglican priest, a writer, a homeschool mom, and very-much-in-love with her husband of 22 years, The Rev. Canon Andrew Gross, Archbishop Foley’s communications director. Andrew and Summer had an Aquila and Priscilla ministry for ten years in a parish along the coast of Lake Michigan. These days she spends the afternoons doing spiritual direction with women around the world, holding their stories and bringing them to Jesus. She is the Director of Soul Care at Holy Cross Cathedral in Loganville GA and leads Healing and Prayer ministries. Summer spent many years paralyzed by anxiety and isolated by a swirl of toxic thoughts. As she broke free, she began studying inner healing and neuroscience and offers a small group where she’s witnesses one person after another transformed by the risen Christ. She’s passionate about giving practical ideas to help women root and establish in God’s love so that they can live out of their identity as God’s beloved. How we can serve out of Christ’s energy and be filled with the compassion of Jesus. Together Summer and Andrew and their three kids (13,12, and 9), love to tent camp, kayak, and eat their way around the world. While she craves the barbecue of Atlanta where they live, Summer is completely sure that heaven is a long table overlooking the Tuscan countryside. Her words and lectio divina videos find a home at aThirstforGod.com and on instagram at @revsummerjoy. I believe the more rooted we are in God’s abundant love, the more we are able to serve with abandon. Feb. 23 St. Matthew’s Lutheran Church, 405 King Street, Charleston, SC. RSVP Contact Sandy Yohman at syohman@yahoo.com, or Cheryl Steadman atcsteadman72@gmail.com by Feb. 20 to make a reservation. All Regional Meetings begin at 10:00 am and end at 2:00 pm. A light lunch will be served. There is not a charge for lunch, but PLEASE RSVP so that host chapters will know how to prepare. The Diocese of SC recently affiliated with ACNA (Anglican Church in North America). A question has been asked by some Daughters and clergy regarding whether the new ACNA affiliation affects the status of Daughters in ACNA parishes. The Order of the Daughters of the King® is a 501 (c)(3) nonprofit corporation supported solely by the dues and donations of its members and friends. Daughters of the King may be members of Anglican, Episcopal , Lutheran , and Roman Catholic churches. The Order is not controlled by any denomination and currently has about 24,000 women and girls in its membership in the United States and nearly 5,000 members in the Anglican Communion in 21 countries throughout the world. Our DOK SC Assembly currently has Anglican, Episcopal, and Lutheran Daughters. The Diocese of South Carolina's affiliation with the Anglican Church in North America (ACNA) does not change the membership status of Daughters in the Diocese of SC. Everything remains the same. If you have questions or members of your clergy have questions, please contact me directly. I will be glad to discuss any questions that you may have about The Order.